When events in the US dominate the news, is there still an appetite for political and humanitarian response to crises like the mudslides in Sierra Leone? 28 Aug 2017 – The mudslides in Sierra Leone on August 14 and, just a few days later, in the Democratic Republic of Congo have resulted in two new humanitarian crises — in Sierra Leone, more than 500 lives have been claimed. The two mudslides, however, have been overshadowed by events before and since, namely the violence in Charlottesville, Virginia, and the attack on Barcelona’s popular La Rambla strip. More recently, tropical storm Harvey, which at the time of writing has caused five deaths and resulted in thousands needing shelter in Texas, has dominated media coverage over the past several days. But back in Sierra Leone, where more than 10,000 succumbed to Ebola just a few years ago, hundreds are now missing and presumed dead, hundreds more children have been left orphaned, countless others are now homeless. An estimated 20,000 have been displaced. Torrential rainfall has continued and the threat of epidemic is looming large. Inhabitants of Freetown are particularly shell shocked; it’s not every day one sees about half of a mountain detach itself, flowing, shedding mud, dragging houses with trapped residents. In the area worst hit, just outside of Freetown, most were still sleeping when the flowing earth engulfed them, turning the entire area into a mass grave. 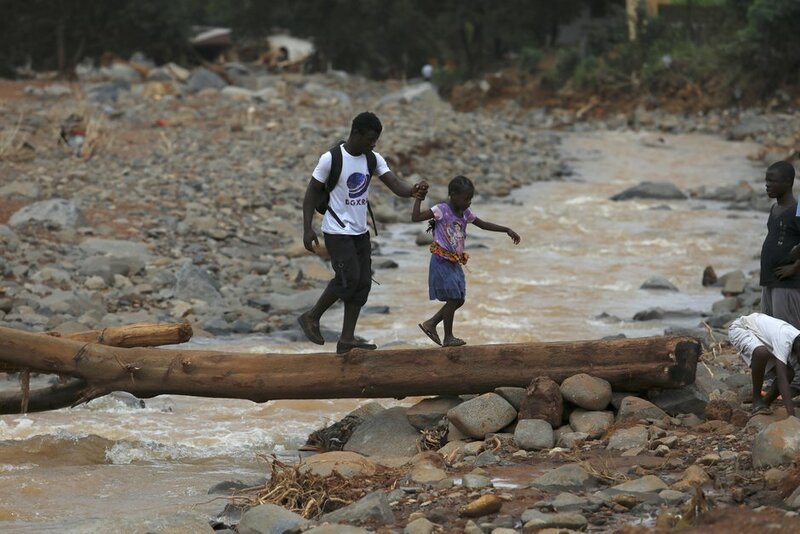 The situation in DRC, where 200 were killed by landslides earlier this month, is also dire. Apart from those affected, the United Nations recently reported 7.7 million people were already on the verge of starvation, mostly as a result of the disruption conflict has had on farming activities. This begs the question – on a global level, do black lives really matter? In response to the crisis in Sierra Leone, most aid has come from China and neighbouring African countries. Possibly because China is involved, the United States remains mostly aloof, looking the other way. Russia is tight lipped. India, who traditionally remains neutral and is usually amongst the first to help, has not stirred, showing a marked alignment with US interests. This is what geopolitics has come to. Mostly it has been other African nations who have come forward. Analysts are attributing the landslides to factors like rampant deforestation, mining, urbanization and possibly climate change, much of which can be related back to a colonial legacy and subsequent economic subjugation. Now regions are left to fend mostly for themselves in the event of a calamity. One also wonders where the world’s foremost philanthropists and self-declared champions of Africa are, such as Bill Gates. Gates’ Twitter page has a collage of African images as a header picture, but where is the attention now; not even a tweet on recent events? Now would be a good time to remove those virtual reality goggles, Bill. Ditto for foreign companies who have business interests in Sierra Leone. But there is much more work to be done, more funding is needed and, like the response to Ebola, it needs to be a long-term investment. Jugal Shah is a writer and activist based in Yangon, Myanmar.